Weekly Photo Challenge: Illumination – Travel. Garden. Eat. A library is a classic example of a resource for intellectual enlightenment, and the Rose Reading Room’s decorative lighting at the New York City Public Library is not so shabby, either! The American Library Association has created a “Library Bill of Rights” affirming public libraries as important protectors of intellectual freedom and enlightenment. Even as computers and internet access seem to often displace the paper versions of books and research guides, libraries have kept pace with the times, provide critical public access to computers, adding electronic books for e-readers to their collection, and offering free seminars and discussion groups on both educational and entertaining topics. In a time of increasing concern over the “haves” and “have nots” in the United States, the public library continues to act as a free, nondiscriminatory, open resource for all. Have you visited or supported your local public library lately? If not, perhaps pay it a visit and drop a donation to your library’s foundation sometime in 2013! It is an important community asset and resource that must be maintained. For more information on the history of the “Library Bill of Rights” and other resources from the American Library Association, click here. This post was in response to the Daily Post’s Weekly Photo Challenge. “Illumination” was this week’s theme. Everyone is welcome to join in the Challenge; further details on how to participate and links to others’ responses are found here. Love the photography and the reminder to use and support the public library. There is something about old buildings that inspire. This setting seems a perfect place for books and learning. My local library branch is housed in a small building without much character but I love visiting and browsing the shelves nevertheless. Great photo and great take on the theme. Hooray for the public library! I have always been a very enthusiastic supporter. Lovely shot! Few of us think to admire the architecture of a library when we’re inside. Like you I tend to be wowed by everything around me. I’m sure I would’ve been gazing at what you’ve portrayed above…with mouth wide open. We seem like “sisters under the skin”…and I’m glad. 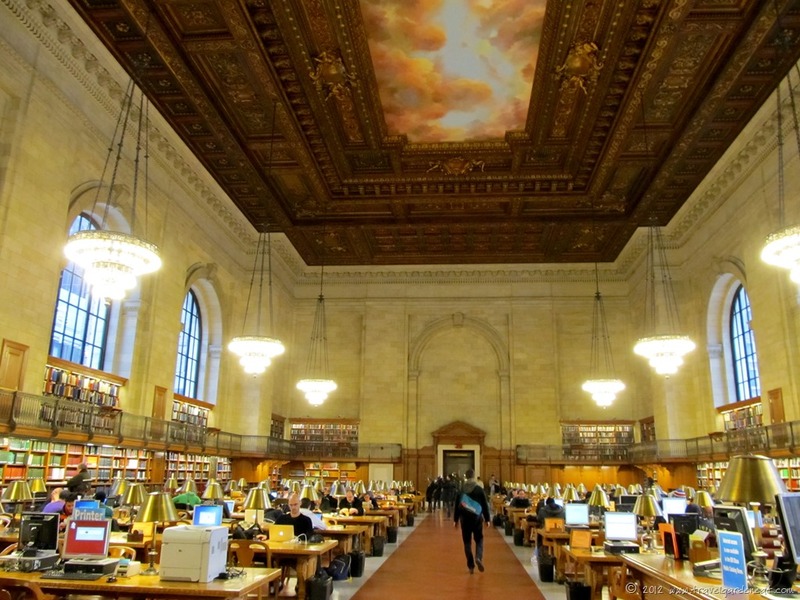 Pingback: New York’s Public Library as a Travel Destination | Travel. Garden. Eat. Pingback: Exploring Boston: Another Public Library Gem | Travel. Garden. Eat.